I've been neglecting myself and it has to stop. Just a few pictures to finish the year, before I take a break. I like to buy truly free range eggs as often as I can and was delighted to find these with only 14 "chookens" per hectare. To be classified as Free Range, chicken farmers must have no more than 10-15000 hens per hectare. If you ask me, that's far too many chooks in a small space. The big supermarkets buy "free range" eggs from farmers who have the allowable limit. Those eggs are often pale yellow and have no taste. 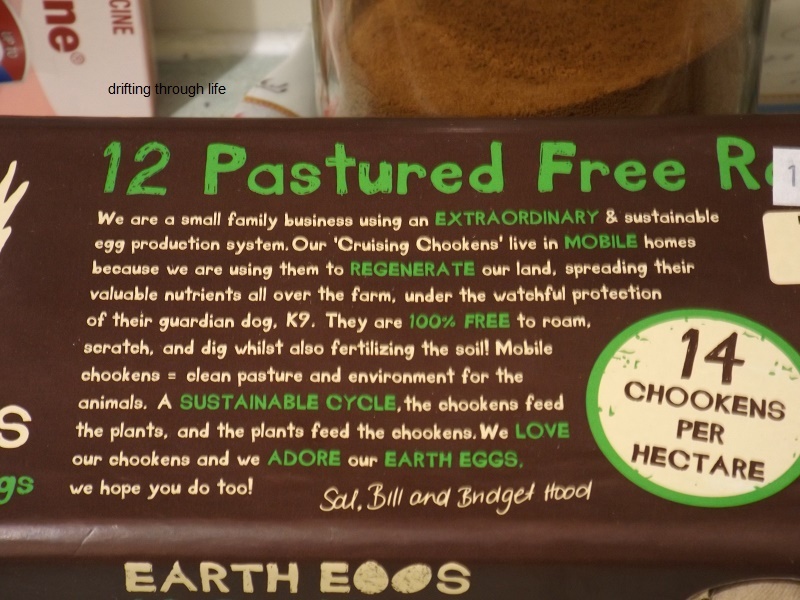 this is what it says on the box: "We are a small family business using an EXTRAORDINARY & sustainable egg production system. Our 'Cruising Chookens' live in MOBILE homes because we are using them to REGENERATE our land., spreading their valuable nutrients all over the farm, under the watchful protection of their guardian dog K9. They are 100% FREE to roam, scratch and dig whilst also fertilising the soil! Mobile chookens =clean pasture and environment for the animals. 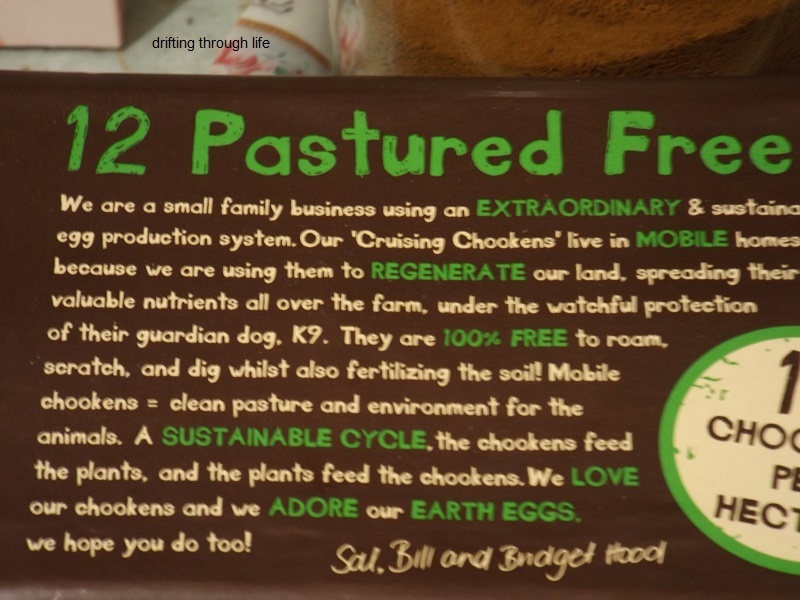 A SUSTAINABLE CYCLE, the chookens feed the plants, and the plants feed the chookens. 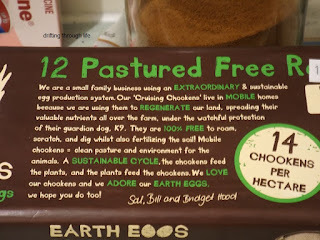 We LOVE our chookens and we ADORE our EARTH EGGS, we hope you do too. Sal, Bill and Bridget Hood." This is PERMACULTURE! a system I've long been a fan of. I haven't yet tasted these eggs, the test comes tomorrow morning at breakfast. Lola hiding sleeping behind the curtains. Right now she is back to hiding under the bed where it is dark, I suspect she has another bad headache caused by her hayfever and will be going to the vet again as soon as I can make the appointment. This will be the third time this season, I hate to see her suffering. I have occasional migraines myself and know how bad that feels. 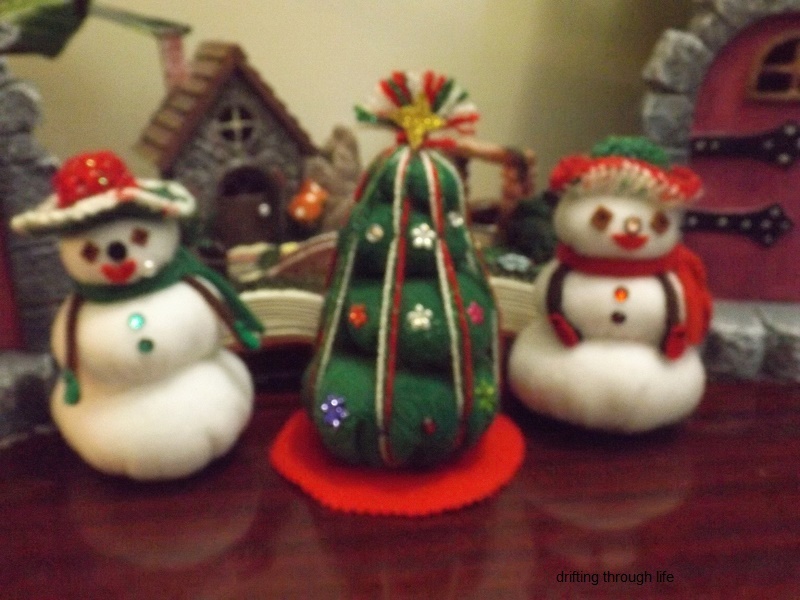 a little blurry, my small felt Christmas tree flanked by Mr and Mrs Snow. 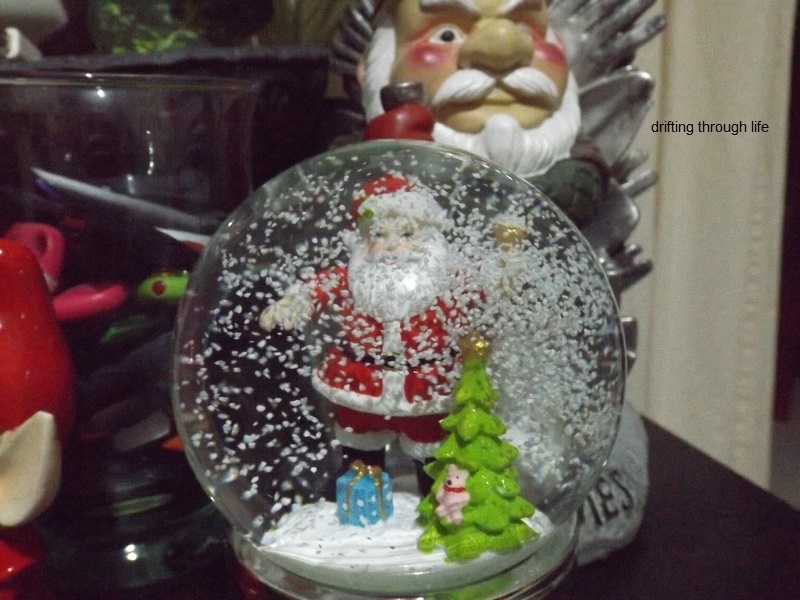 a blizzard in a snowglobe. What could it be hiding? 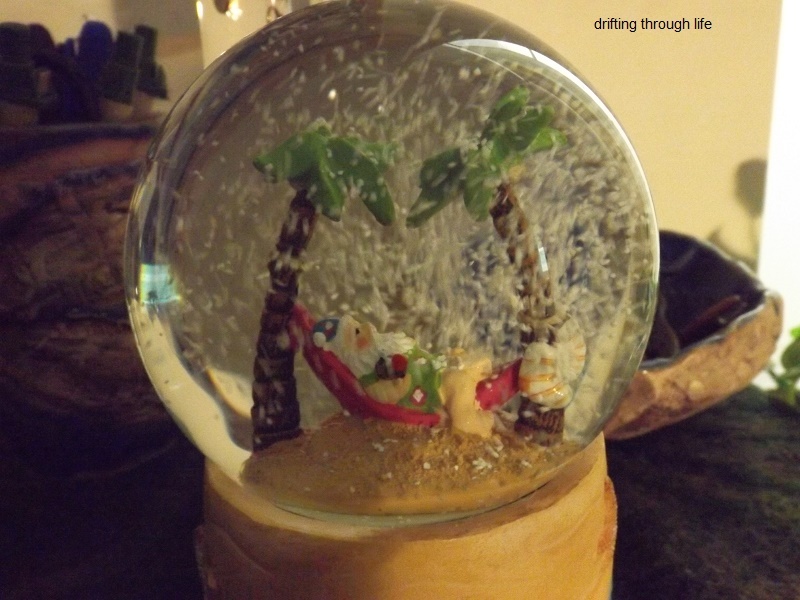 of course now that Christmas is over, Santa is enjoying a well deserved tropical holiday, in a hammock slung between two palm trees. If you enlarge the photo, you may see he is wearing a swimsuit and holding a tropical drink. being Santa, he is able to use his magic to whip up a mini blizzard whenever the tropics get a bit too warm. I'll be back (famous last words) with Sunday Selections, I just don't know when. Taking, processing and sorting the photos to be used takes me quite a bit of time and there are other things I need to be doing. Love your Sundays. Maybe just post us your garden, as you go along. I'd quote Author, but don't know how to do emojis. Joanne; I know how to do emojis, but not in the comments boxes. The garden isn't doing much right now, just surviving the summer heat, the flowers have finished. Poor Lola. Did not know she got headaches. I use to have migraines and so understand the need for dark and quiet. Hope the vet gives her relief. Arkansas Patti; before Lola, I didn't know cats (dogs too) got headaches or hayfever. All the vet can do is give her a painkiller injection, with maybe an antihistamine as well. I'll be glad for her when the season is over. I like your snow globes, I bought my first one this year. 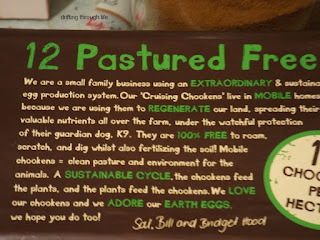 That is a great chooken enterprise and good to support the farmers with your purchase. 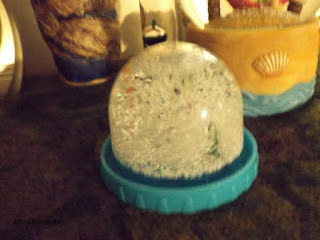 Terra; I love snow globes, we had a few when we were kids, but I haven't had any for a long while. Most I found in previous years were not nice and had very little "snow" which always settled too fast. These are better quality and were reasonably priced. Poor, poor Lola. Battling recurrent sinus infections I feel for her. And hope that the vet can recommend a longer lasting treatment. Hooray for properly free-range eggs. The upper limits are ridiculous. PS: Hooray for looking after yourself - which shouldn't have been a PS. Elephant's Child; I'll still be reading and commenting, but may limit that to a couple of hours in the evening, so I can get out and about walking during the daylight hours. I can't be going out after dark anymore. I'll ask the vet about a longer lasting treatment and maybe request a blood test to find out what allergies are causing her to scratch herself raw so often. Free range eggs don't cost much more than regular eggs these days and taste so much better. Enjoy your break, River. Make sure you do take things easy....rest up...I, like everyone else, look forward to your return...at your own pace. Poor little Lola...I, too, hope the vet can find a lasting treatment...better still cure, for her. Lee; I will be taking things easy as I get moving, took a walk around the block last night and ached so badly it was a 25 minute torture trail. Used to be I'd get around the block twice in 15 minutes. I don't think a cure for hayfever is possible, but maybe a longer lasting injection of whatever he gave her last time. Real life is top priority and you are wise to take the time you need away from online time. I love the felt Christmas tree and Mr. and Mrs. Snow! 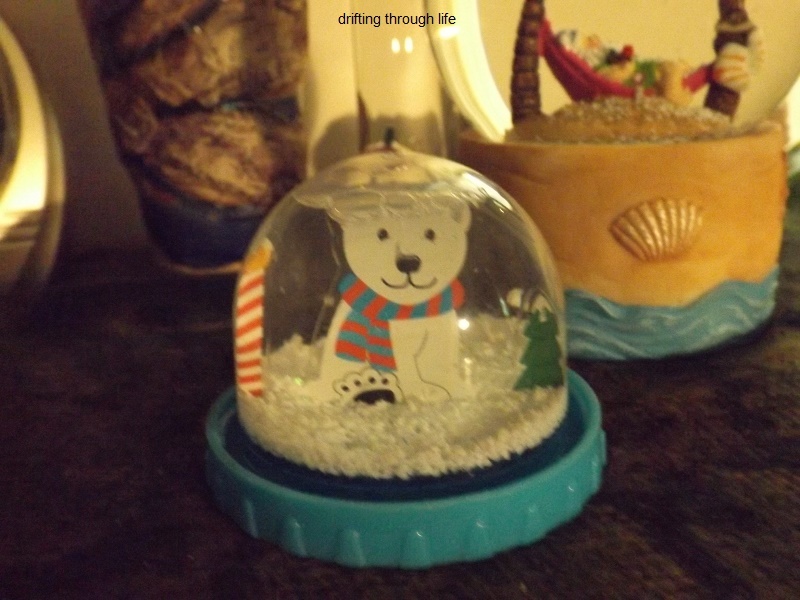 The snow globes are fun, too. Kids always seem to love them, and I must be a big kid because I like them too. jenny_o; I need to get off my bum more, sitting by the computer all day, then by the TV at night has caused a few problems with the legs. They just don't want to work (walk) anymore and that's not good. I found the felt decorations at a Christmas Craft fair several weeks ago. 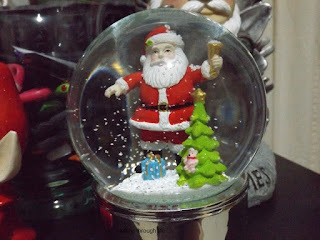 snow globes are always fun, just need to remind small children not to shake them vigorously. P. S. Poor Lola. I hope she feels better soon. jenny_o; I hope so too, she is off her food a bit too, just like last time. Before the neighbor dogs killed our chickens, we let them roam over the 4 acres that make up our front yard and barn field. The eggs were delicious, with dark orange yolks (sometimes double!) that can't compare to regular store-bought eggs. We had about 29 chickens at the height of our flock, until they dwindled by one or two per day. I'm not saying the dogs killed every one of them, because I imagine a coyote or other varmint might have snatched a couple. But the neighbor dogs were caught with some carcasses down by their own house, and used to chase our dogs up on our porch if they tried to intervene. Val; they were just doing what dogs doo, which is sad for the chickens and you. Eggs fresh from the hen are the best, I used to get free ones from my daughter's chickens until the fox got them. She only had three hens. So sad that Lola has bad headaches, i hope she feels better soon. That farm sounds fabulous, if i had to live in the country, i'd want roaming chookens. Christmas still having a bit of a day in the sun is a good thing, at least through Epiphany. Mr. BA is having us put up the greenhouse. messymimi; Lola will be fine after her visit to the vet. I've managed to coax her into eating and drinking a bit and she doesn't seem as bad as the last time. The hayfever season is almost over now. peppylady (Dora) they are happy, being made of felt they will never melt. 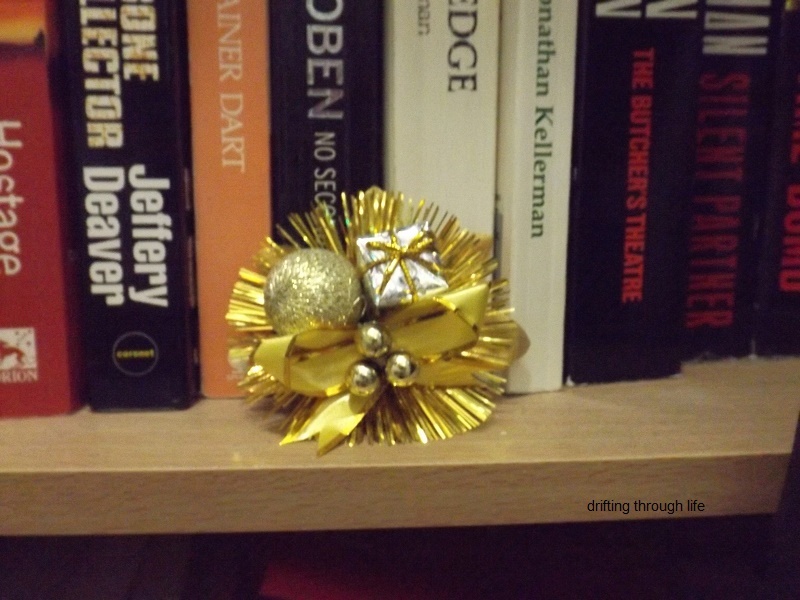 I've packed them away now until next Christmas. Enjoy some blogging time off. joeh; I suspect I'll be doing a lot of sleeping. I think I may do the same for a while. I have not taken a break, aside from holidays, in my 14 years. I am having trouble fitting everything into my life, yet I spend enough time doing nothing. I like the sound of the 'proper' free range eggs. How much did they cost. I am quite happy to pay more for proper free range eggs. 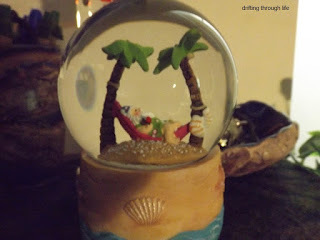 I like Santa relaxing in the hammock. Andrew; a well-earned break seems to be in order for you too. The eggs vary in cost between $6.99 and $8.99 per dozen depending on what brand I buy and what size eggs. They come in 700g or 800g. Buy a chook then you get free range eggs only trouble is finding them, Drummy was very good at hiding them but I do miss her eggs they were dark yellow to orange and very tasty even if she did eat a lot of snails and slugs, have a good break. These free range eggs have lovely dark yellow yolks. Poor little Lola....lucky she has you to care for her. And you, you look after yourself you hear???? only slightly confused; Lola will be fine as soon as she sees the vet and hayfever season is almost over now. 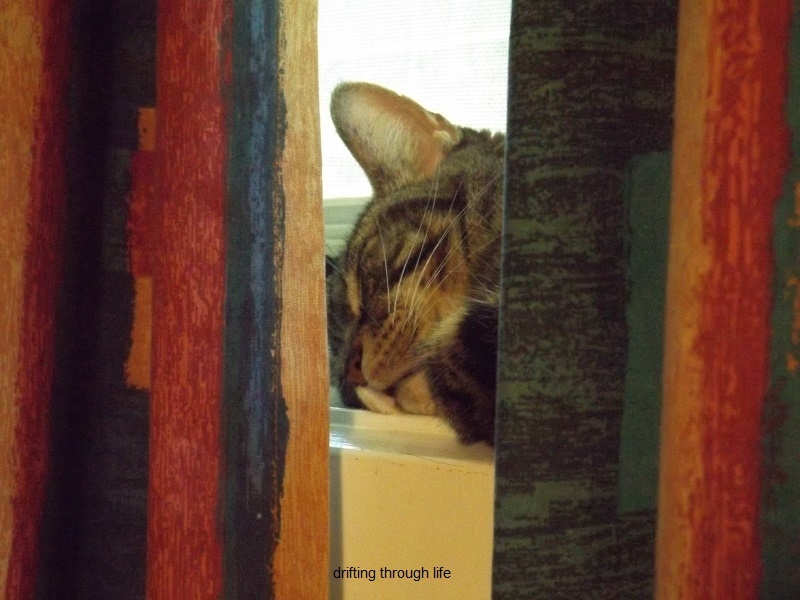 I'll be doing a lot of sleeping until the worst of the heat is over, sometime around April. R&R definitely for you. It will do you a power of good. And all the best in 2019, it has been a delight reading your blog and enjoying these photographs! Wisewebwoman; the hands and wrists definitely need far more rest than the rest of me. I need to save them for the writing of Words for Wednesday stories. Happy New Year River. Your Sunday Selections have always been interesting but I can see how they take away from your time. I haven't blogged as much as in the past and hope to do better in 2019. Granny Annie; the time is a big thing, too much computer means I don't get much else done, especially going outside, but the bigger problem is the pain in hands and wrists. Time consuming is a blog but I enjoy and need a rest from it at times. Margaret-whiteangel; Happy New Year. I'm a big fan of snow globes too. I have been AWL from my PC, now back again . where are words this week. oh . I forgot "HAPPY NEW YEAR TO ALL OF MY FRIENDS AND READERS< All nine of them. New Year record . I was the first customer to enter my local ALDI store on New Years Day. Vest; words this month are at Lissa's http://thememoryofrain.blogspot.com, last week she provided words, this week two photos to write about.